If there is an unauthorized change or access event, for instance, to a piece of Office 365 SharePoint Online content, such as files or documents in a document library, you need to be the first one to know about it, so you can ensure nothing threatens your critical data. The native tools can help you improve your data security and compliance posture by enabling you to configure auditing and monitor user and admin activities to spot suspicious actions. 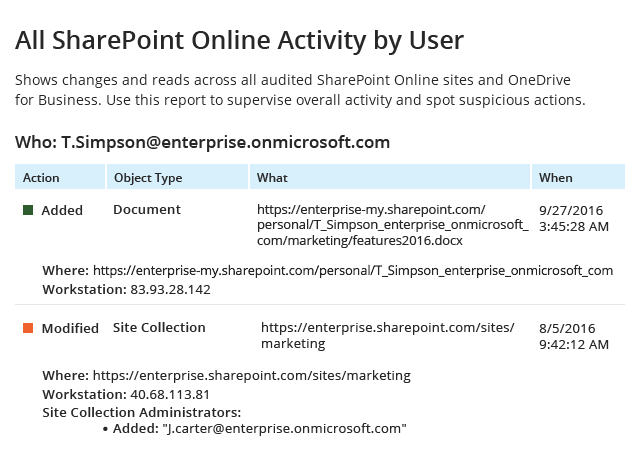 However, they don’t provide you with comprehensive, detailed SharePoint Online audit log reports that could expedite issue identification and remediation and help you pass compliance audits. The search capability provided by the built-in Microsoft Office 365 audit logs has limited filtering options, which makes it hard to spot and mitigate risks before it’s too late. The limited number of predefined reports and lack of report filtering make it hard to find quickly what you need. There’s no report subscription function, so you have to spend time manually exporting specific audit data into Excel and massaging it in order to present the auditing information in a readable format. You have to continuously export your audit log to save it for later use, because the Security and Compliance Center does not provide any storage options. Save time with ready-to-use predefined reports that provide easy-to-read, insightful information for spotting threats and providing compliance — not raw audit log data. Simplify reporting by subscribing yourself or auditors to the reports each of you needs. Identify threats and investigate aberrant activity in minutes with the Interactive Search feature. Be the first to know about any activity you deem critical with custom alerts that you fine-tune to your specific environment. Keep your consolidated audit data securely for over 10 years in a cost-effective two-tiered storage (SQL database + file-based).